Back from San Francisco- with lots of foodie stories to share! When I travel, it’s all about food- well, at least 85%. It’s about trying new fare and seeing what’s in, what’s local. It’s about color and spice and just plain satisfying the palate. Food-wise, San Francisco is a beautiful fusion of culture. I felt like I traveled the world in only a couple weeks. Sometimes I almost felt like I was back in France (French-inspired cafés and bakeries run rampant, as do fine red wines and decadent cheeses). Other times I was transported to far-off places like China, Italy, and Thailand. San Francisco is definitely the place if you like variety- high quality, healthy variety that is. What struck me most about the city is its abundance of fresh, organic produce and gourmet-style vegetarian cuisine. You can’t write just one post on an entire trip, so I’ll be spreading my San Francisco food adventures over several days. I’ll talk about a few excellent restaurants, including my new all-time favorite, Green’s. I’ll also fill you in on tea, coffee, fortune cookies and cupcakes. Let’s start with farmers’ markets, though- essential when visiting this vibrant , farmer-friendly city. I made it to two a couple open-air markets, but the Ferry Plaza Farmers’ Market was my favorite: a definite must if you’re in San Francisco on a Tuesday, Thursday or Saturday. Overtaking the Ferry Building Market Place in the Embarcadero neighborhood, this market has a great community vibe. It’s happy. It’s bustling. It’s full of mouth-watering samples. My mom and I started our morning out at Frog Hollow Farm’s café just inside the Ferry Building back doors. Actually, we ended up spending more than just one morning here- thanks to the cherry almond scones and well-made coffee drinks. Revved up and ready to go, we headed to the clock tower to meet up with a good college friend of mine and take in the humming sights, sounds and tastes of the market. Meyer lemons were everywhere, from Frog Hollow Farm’s zest-filled lemon marmalade to lemon-flavored quark cheese. 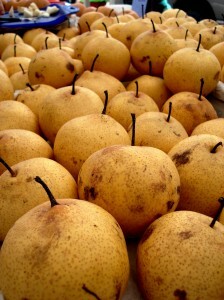 These sweet, fragrant lemons are originally from China, but are the craze in California today. Quark cheese, originally made in Eastern Europe, proved to be a special, and addictive, find. It’s a soft cheese, kind of a cross between ricotta and cream cheese. While the garlic, lemon and vanilla flavors were all fun, we all ended up favoring the latter. The cheese naturally has a slight tang which gives a subtle kick to the vanilla. Such quark is great at breakfast, spread over warm toast or homemade scones. 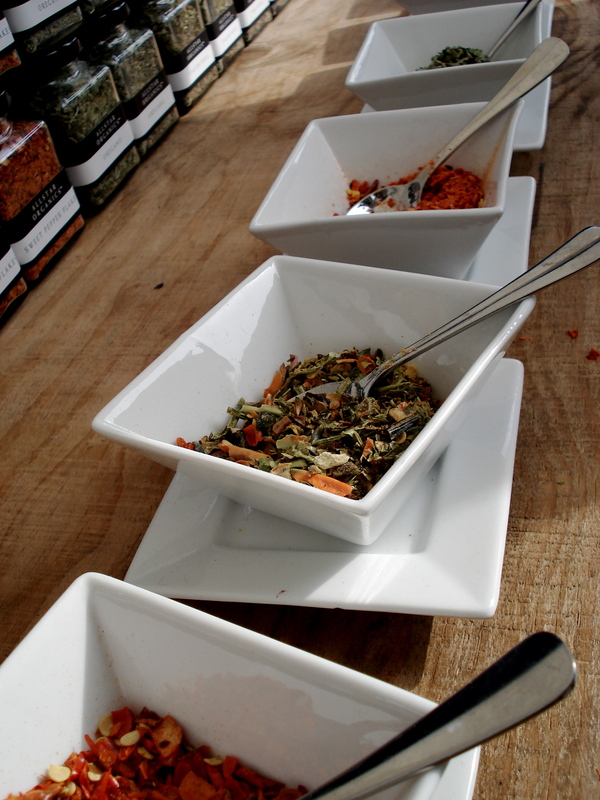 We eagerly wandered from stand to stand in awe at all the edible originality for sale. Tangled kiwi vines- well, those aren’t actually edible, just a sight for the eyes. 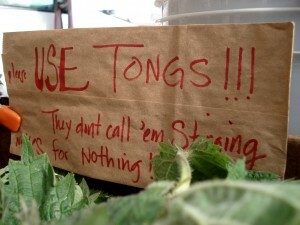 Stinging nettles- yes, those are edible, when cooked. Cap’n Mike’s Indian Smoked Salmon, (basted in honey). Herbal sugars- such as lemon (there it is again!) verbena and rose petal- and dried Thai basil at the Allstar Organics booth. 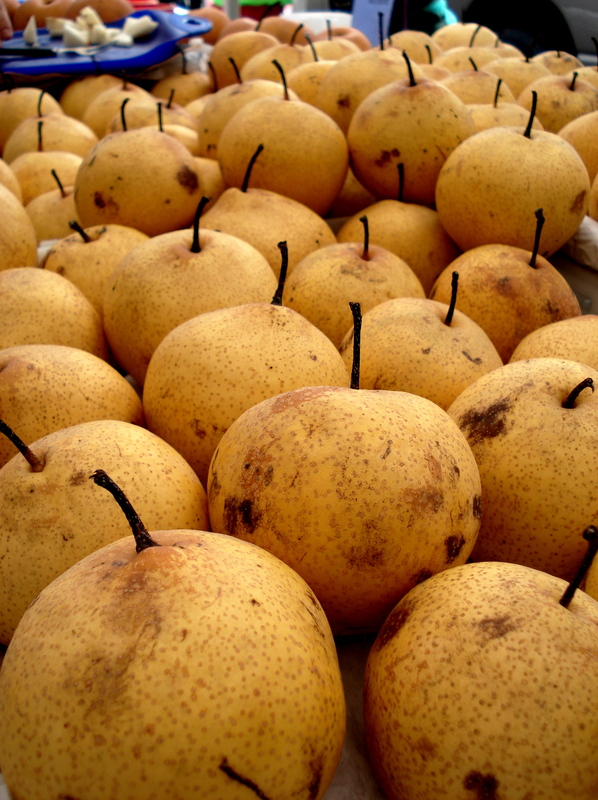 Crispy, juicy Asian pears (which had a slight lemon flavor by the way). On more of a French note, we encountered huge bundles of fragrant, organic lavender; some not-so-ordinary mushrooms; rich, creamy cheeses; fine red wines; and excellent renditions of real French bread. 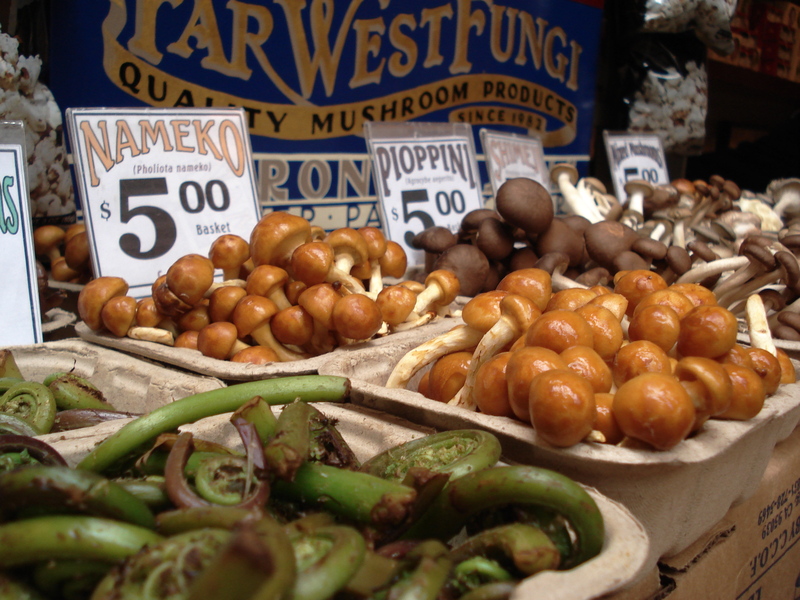 Just inside the Ferry Building doors, for example, lies Far West Fungi, a small shop that offers all sorts of intriguing mushrooms I’d never heard of before (like Nameko and Pioppini). Also inside the building is the Cowgirl Creamery, the Ferry Plaza Wine Merchant and the Acme Bread Company. The best way to combine it all (and feel a little French) is to sit down for wine, cheese, marinated mushrooms and baguette at the wine bar. We ended up going back to the Ferry Building several times. On one such occasion, we enjoyed two 2007 Californian reds: a Scribe Pinot Noir, Carnezos-Sonoma and a Nalle Zinfandel, Dry Creek Valley. The cheese: a ½ round of Mt. Tam. The bread: an entire, fresh épi baguette. Whether you start the day or finish it at the Ferry Plaza Market and Ferry Building merchants, you can’t go wrong. The market itself gets my “kudos for sustainability” for it’s support of local farmers and various other environmentally-friendly initiatives. The vendors, for example, only dispense bags that are compostable or recyclable– important since, as I learned, the City program doesn’t recycle just any old plastic bag! All the market excitement almost made me wish we didn’t have dinner reservations that evening. I wanted to shop and cook, shop and cook- especially some of the stranger looking mushrooms. Fortunately, Green’s restaurant, and their mushrooms, was well worth the sacrifice. This entry was posted in Travel outside France and tagged cheese, fruit, markets, San Francisco, travel, vegetables, wine, wine bars. Bookmark the permalink.